Berkeley Shambhala Center is located in the heart of downtown Berkeley at 2288 Fulton Street (at Bancroft, directly across the street from UC Berkeley). Berkeley Shambhala Center is located 3 blocks south and one block east of the Berkeley Bart Station. 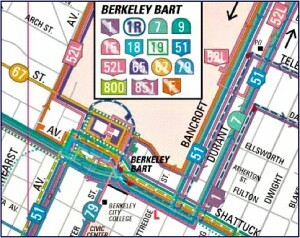 There are many buses in downtown Berkeley. Visit: for a complete list of local buses, or dial 511 for public transit and traffic information. Take 580 West to Dublin. Take 680 north to Walnut Creek. Take 24 west towards Oakland. After passing through the Caldecott Tunnel, take the Berkeley exit onto Tunnel Road (Highway 13). Continue west on Tunnel Road past the Claremont Hotel. Tunnel Road will become Ashby Avenue. Continue on Ashby Avenue past Telegraph Avenue to Shattuck Avenue. Turn right on Shattuck Avenue. Continue on Shattuck Avenue to Kittridge. Turn Right onto Kittridge, and make the next right onto Fulton Street. Take 580 west all the way to Oakland. Take Highway 13 (Warren Freeway) to Berkeley. Continue on High- way 13 to Tunnel Road as described above. Take Interstate 80 to Berkeley and take the University Avenue exit. Take University Avenue east approximately 1.5 miles until it dead ends. Turn right onto Fulton, and go approximately 3.5 blocks. After you pass Kittredge, 2288 Fulton Street is in the large building that occupies most of the block. The entrance is just before the corner of Bancroft. Berkeley Shambhala Center is on the second floor, accessible by elevator and stairs. On Sundays and holidays there is usually ample, free street parking in the neighborhood. During athletic events at UC Berkeley, parking on the street is less available visit <events. berkeley.edu> and click on “Sports” for a calendar. On weekdays there is metered, street parking and two- hour free parking in the residential neighborhoods south of Dwight, west of Martin Luther King, and north of UC Berkeley. On Saturdays many of the two-hour parking zones (described above) are available for unlimited parking. Download parking instructions here (.pdf download).